Elmer Gantry is just the latest success for the increasingly adventurous company. Elmer Gantry. 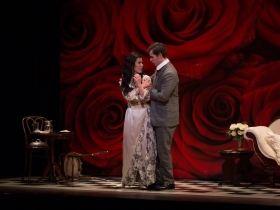 Photo from Florentine Opera Company. 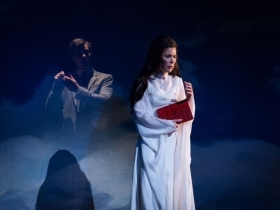 Under its director William Florescu, Milwaukee’s Florentine Opera has become a leader in performing and recording new operas. 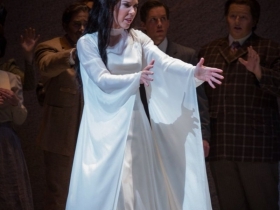 That would be surprising for any regional opera house, but is all the more so for the Florentine, which for most of its 82-year-history performed classic operas, with a heavy emphasis on Italian composers. This past weekend the Florentine revived Elmer Gantry, both because it’s a wonderful work and because it will help cement the work’s reputation (as well as its connection with Milwaukee). 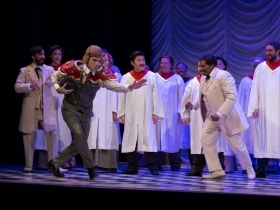 As the production’s director Frank Kelley told the Dial, the premiere certainly presents challenges; “But getting it to go on and have a life after that world premiere is very difficult.” And the Florentine’s well-sung and staged production helps again prove the work’s potential to become known as a great American opera. 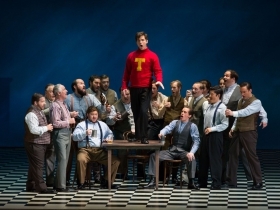 Next season, word has it, the Florentine will again try something adventurous, producing a recent opera by an American composer who is winning increasing acclaim. The details will be released next week. 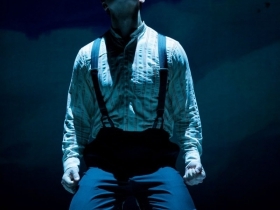 In the meantime, if you missed Gantry, you can listen to excerpts from the recording here and our photo gallery below offers images from last weekend’s production. I didn’t miss Elmer Gantry – and, besides the always wonderful singing, what highly (successful) surrealistic sets! Milwaukee can be particularly proud of its Florentine Opera – I just attended an event at The Iron Horse Hotel highlighting the operas in its new season!